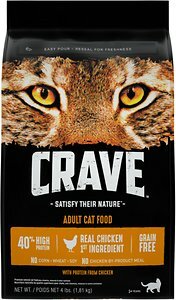 Crave’s tagline is Satisfy Their Nature™ and it’s marketed as ancestrally-inspired, meat-centric food that honors your cat’s carnivorous nature. But is it a healthy, high-quality choice for your cat? Find out in our unbiased Crave cat food review. We’ve analyzed Crave cat food and graded it according to the We’re All About Cats standard, evaluating the brand on species-appropriateness, ingredient quality, product variety, price, customer experience, and recall history. Here’s how it measures up to our quality standards. We give Crave cat food a 47 out of 60 rating or a B+ grade. Crave’s parent company has been in the pet food industry since 1939, when Mars introduced Kit-E-Kat® cat food to the European market. Today, Mars Petcare owns over 40 pet food brands, including Whiskas, Iams, Royal Canin, Nutro, and Sheba. In 2017, the company brought in over 17 billion dollars in revenue, making it the highest-earning pet food company in the world. Crave cat food is manufactured in several Mars-owned facilities around the United States. While they don’t specify exactly where they source their ingredients, Mars tries to buy ingredients near their manufacturing facilities. They test every batch for ingredient integrity and audit their suppliers on a regular basis. Has Crave cat food been recalled? It doesn’t appear that Crave cat food has been recalled since its creation in 2017. What kinds of cat food does Crave offer? The Crave cat food lineup includes both dry and wet cat foods. All of their foods are grain-free with no corn, soy, or wheat and features meat as the first ingredient. Like all Crave recipes, this food features meat as the first ingredient. Chicken leads the ingredient list, followed by chicken meal, which is a concentrated source of animal protein. Further down the ingredient list, the recipe includes fish meal, another concentrated source of animal protein. In addition to meat, the food includes several plant protein concentrates. Pea protein, potato protein, and dehydrated alfalfa meal appear on the ingredient list. Other plant ingredients include split peas, tapioca meal, and dried plain beet pulp. All told, Crave with Protein from Chicken is high in protein with low fat and moderate carbohydrate content. It has 402 calories per cup. Chicken, Chicken Meal, Pea Protein, Split Peas, Chicken Fat (preserved with Mixed Tocopherols), Tapioca, Fish Meal, Dried Plain Beet Pulp, Potato Protein, Dehydrated Alfalfa Meal, Natural Flavor, Potassium Chloride, Choline Chloride, DL-Methionine, Salt, Mixed Tocopherols and Citric Acid (preservatives), Taurine, Zinc Sulfate, Vitamin E Supplement, L-Ascorbyl-2-Polyphosphate (source of Vitamin C), Iron Amino Acid Chelate, Yucca Schidigera Extract, Vitamin B12 Supplement, Copper Amino Acid Chelate, Niacin Supplement, Manganese Amino Acid Chelate, Biotin, Riboflavin Supplement (Vitamin B2), D-Calcium Pantothenate, Thiamine Mononitrate (Vitamin B1), Vitamin A Supplement, Pyridoxine Hydrochloride (Vitamin B6), Sodium Selenite, Vitamin D3 Supplement, Potassium Iodide, Folic Acid, Rosemary Extract. Crave’s Chicken and Salmon recipe is marketed for indoor cats. Like most indoor cat foods, it has higher-than-average fiber content and has low calorie content. In theory, these qualities help to reduce hairballs and prevent obesity. Like Crave with Protein from Chicken, this food’s ingredient list begins with chicken and chicken meal, followed by pea protein and split peas. It relies on chicken fat as a species-appropriate primary fat source. Tapioca is an additional source of starch and helps to bind the kibble. Dried plain beet pulp serves as a source of fiber, followed by three additional sources of protein. One is potato protein, followed by salmon meal and dehydrated alfalfa meal. Overall, this food has moderate protein content, low fat, and high carbohydrate content. It has 379 calories per cup. Chicken, Chicken Meal, Pea Protein, Split Peas, Chicken Fat (preserved with Mixed Tocopherols), Tapioca, Dried Plain Beet Pulp, Potato Protein, Salmon Meal, Dehydrated Alfalfa Meal, Natural Flavor, Flaxseed, Potassium Chloride, Choline Chloride, DL-Methionine, Salt, Mixed Tocopherols and Citric Acid (preservatives), Taurine, Zinc Sulfate, Vitamin E Supplement, L-Ascorbyl-2-Polyphosphate (source of Vitamin C), Iron Amino Acid Chelate, Yucca Schidigera Extract, Vitamin B12 Supplement, Copper Amino Acid Chelate, Niacin Supplement, Manganese Amino Acid Chelate, Biotin, Riboflavin Supplement (Vitamin B2), D-Calcium Pantothenate, Thiamine Mononitrate (Vitamin B1), Vitamin A Supplement, Pyridoxine Hydrochloride (Vitamin B6), Sodium Selenite, Vitamin D3 Supplement, Potassium Iodide, Folic Acid, Rosemary Extract. Salmon appears to be the primary protein source in this wet cat food. This Crave salmon paté is made primarily from meat ingredients. Salmon, chicken liver, pork broth, chicken broth, and chicken heart lead the ingredient list. The food contains fish oil as a species-appropriate source of omega-3s. Guar gum, tapioca starch, and carrageenan are used as thickeners and binders. These ingredients add to the food’s carbohydrate and fiber content. Carrageenan may contribute to inflammation and cancer. Carrageenan is the food’s most questionable additive—the food is free of artificial colors, flavors, and preservatives that might make your cat sick. Overall, this is a meat-based food that’s high in protein with moderate fat and low carbohydrate content. There are 39 calories in each 1.32 oz serving. Salmon, Chicken Liver, Chicken, Pork Broth, Chicken Broth, Chicken Heart, Natural Flavor, Guar Gum, Potassium Chloride, Fish Oil (preserved with Mixed Tocopherols), Dried Tomatoes, Carrageenan, Sodium Acid Pyrophosphate, Magnesium Sulfate, Calcium Carbonate, Tetrasodium Pyrophosphate, Tapioca Starch, Salt, Choline Chloride, Sodium Hexametaphosphate, Taurine, Thiamine Mononitrate (Vitamin B1), Vitamin E Supplement, Zinc Sulfate, Ferrous Sulfate, Manganese Sulfate, Potassium Iodide, Pyridoxine Hydrochloride (Vitamin B6), Copper Sulfate, Vitamin D3 Supplement, Folic Acid, Menadione Sodium Bisulfite Complex (source of Vitamin K Activity). 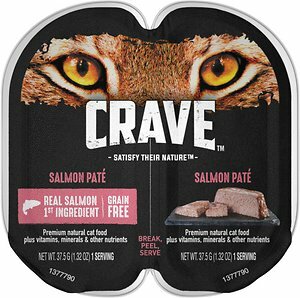 What do customers think of Crave cat food? Crave cat food listings consistently receive four and five-star reviews. Customers like that they can buy it at their grocery or convenient big box store. Cats love the way Crave tastes. How much does Crave cat food cost? Crave dry foods are moderately-priced at around $0.20 per ounce or roughly $0.49 per day for the average 10-lb cat. Crave’s wet recipes are more expensive at around $0.40 per ounce or $2.75 per day. Overall, is Crave a good choice? Crave cat food isn’t nutritionally excellent, but it’s better than most other foods sold at discount stores and groceries. It’s easy to find, easy to feed, and a hair more nutritious and species-appropriate than other foods at a similar price point. To get the best out of Crave, choose their wet foods rather than their dry formulas. Crave’s wet cat food recipes have lower plant content, lower carbohydrate content, and simpler ingredient lists than the dry ones. Where can you buy Crave cat food? You can buy Crave through pet specialty retailers, big box stores, and some grocery stores. Online, Crave is available through Amazon, Chewy, and other web retailers that sell pet food. Click here to shop for Crave cat food on Chewy.